Jades Flower Design works from its design studio in picturesque rural Essex where Beverley also holds her Flower School. Clients are always welcome to visit by appointment, not only for consultations but also to see where their floral creations will come to life. 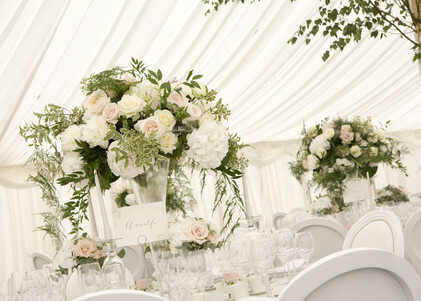 Beverley and her team are work closely with many popular venues across Essex, Suffolk, Hertfordshire and Cambridgeshire. Familiarity with a venue certainly helps Beverley envisage a certain style and look and how it might work there, although any new venue, however unusual, is a welcome challenge. In this case Beverley will arrange to meet you ‘on site’ to discuss what styles and arrangements will be best for the style, character and space of the venue.